To the newest members of the studio…Congratulations on your acceptance to the UT Butler School of Music! Below is some information you should know before classes begin in August, a list of supplies to acquire, and two assignments to complete over the summer. I will email you in August about specific material to prepare for your first lesson. In the meantime, play music you love, tweaking your ears to aim for beautiful sounds and artistic interpretations, executed with excellent rhythm and intonation. A. 2 quotations from master musicians in the book that made an impression on you, with a brief explanation of why you want to remember those words and concepts. Include the name and position of the person who said the wise words. Choose 2 other concepts discussed in these chapters (other than quotations) to summarize. Listen to recordings of at least 4 different artists described in Appendix 1 (pp. 303 to 346). Most of these recordings are on YouTube. Follow along with a score from IMSLP on at least 1 of those. Document which recordings you heard, and on which you followed a score. Write brief reviews of the recordings. Read The Scientific Method of Practicing by Timothy Hagen. Write an email to me with an outline of ideas in the book, and name specific ways in which you have changed your process of practicing as a result of reading it. 2 quotations from master musicians in these chapters that made an impression on you, with a brief explanation of why you want to remember those words and concepts. Include the name and position of the person who said the wise words. Listen to at least 4 more recordings described in Appendix 1 (pp. 303 to 346) of Sound in Motion. Most of these recordings are on YouTube. Follow along with a score from IMSLP on at least 1 of those. Document which recordings you heard, and on which you followed a score. Write brief reviews of the recordings. I highly recommend subscribing to the Bulletproof Musician weekly free emails. These short articles provide excellent insights into constructive ways of approaching our practicing and performing. (Graduate Students Only) M. Piard’s Quatre-vingt-dix etudes, books 1 (scales) and 2 (arpeggios). In your first few lessons, we will discuss which solos and orchestral excerpts to obtain. The following list includes all the tools you will need to form reed blanks (starting with gouged, shaped and profiled cane), as well as for adjusting reeds. In many cases, I am including the brand of tool that I prefer, and the source of the tool. There are certainly other fine options, but I have found the ones listed here to be of very high quality and reliability. It is particularly important to get reamers and mandrels of high quality, since cheaper ones can cause irreversible problems in how your reeds fit onto the bocal. *Indicates this tool is used in adjusting reeds. #Indicates this tool is used in forming blanks. #21 gauge wire. Available at: www.charlesmusic.com. #An easel or dowel at least 5” long and 3/4” diameter. This can be homemade from a broomstick, or you may purchase the Maple Easel (#I-04) from Forrests: http://www.forrestsmusic.com/. *#320, 400 and 600 grade Wet-or-Dry sandpaper from a hardware store. *#You will need a forming mandrel and a holding mandrel. You can get an excellent forming mandrel from Barrick Stees by ordering a pin vise and one mandrel pin http://www.steesbassoon.com/products.htm; and a holding (short) mandrel from any other source; OR a Popkin double ended mandrel from www.charlesmusic.com. Drying rack and 12 mandrel pins from Barrick Stees, https://www.steesbassoon.com/products . *A Rieger diamond reamer from http://www.millermarketingco.com/. #A narrow, round shoelace or thin cotton crochet yarn. #For scoring: A drill tap with or without handle available at hardware stores. The tap I use is 1/4-28 NF. This means it is 1/4″ diameter, 28 threads per inch. The NF or NC are two possibilities on most bolt sizes, meaning coarse or fine thread. Most any tap 1/4″ or larger with 24-30 threads per inch will do. It should be sharp also… most inexpensive generic hardware store ones are not great. Nut and bolt shops are the places to go. If you have the option, get the “bottoming” tap. Each tap kit comes with three taps of gradual tapers. The bottoming one, (used as the final one when tapping threads in a hole that doesn’t go all the way through the object) has the least amount of taper. This one will have the best teeth for scoring cane. *Reed scraping knife by Rieger – Double hollow ground design with specially hardened steel to maintain a sharp edge; flat sided walnut handle for comfort that will not roll off table; a short blade for precise scraping: from www.millermarketingco.com. *Tool Wallet. You can use a cosmetic case, or purchase the Albion tool case (#V-17) from www.forrestsmusic.com. *Bassoon Tip Cutter (#B-33) from www.forrestsmusic.com. *Bassoon Arrow Plaque by Fox (#G-13-F) from www.forrestsmusic.com. *Diamond needle files, one flat surfaced, and one rat-tail. Ensemble auditions take place during the first three days of class in August. All bassoon majors are required to take this audition for the major ensembles, and play in the assigned group. The top players from the audition will be chosen for the rotation between the Symphony Orchestra, Opera Orchestra, New Music Ensemble, and Wind Ensemble which all rehearse Mondays, Wednesdays and Fridays, 12:00 to 2:00. The Wind Symphony and Symphony Band rehearse Mondays, Wednesdays, Fridays 2:00 to 4:00. If you would like to be considered for the rotation, prepare the page of excerpts that will be posted on the Wind Ensemble site around August 1, and/or emailed to you around that date. If you wish to audition only for Wind Symphony or Symphony Band, you may prepare a solo of your choice. Studio Class meets Tuesdays 2:00 to 3:20. Please leave this time open in your schedule. Participation is required for all bassoon majors, as a supplement to lessons. Most often, class activities involve students performing for each other, and offering positive and constructive feedback. Other activities have included mock auditions, repair discussions, discussions about music careers, etc. It is very important to me that the studio offer a supportive atmosphere where everyone feels safe to express themselves musically and verbally. I value hard work, mutual respect, honesty and humor. Taking this class for credit is optional (MUS 276C). If you choose to take it for credit, you will be asked to do a project in addition to the weekly activities of the class. REED MAKING CLASS: Reed Making Class is required for all first year undergraduates. You will make many reeds, and explore the various techniques of improving their performance. Please register for this course at orientation (MUS 115T). This class meets Thursdays from 2:00 to 3:20. INSTRUMENTS: I encourage students to purchase their own instrument as soon as possible. 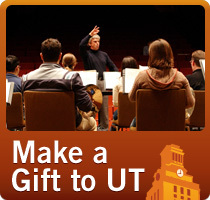 If you do not yet have one when you enroll at UT, you may borrow one beginning at your orientation session. Contact me about arranging this.